More about recording progress than a bona fide post, I am happy to announce that not only have the missing, damaged dry stone wall sections be rediscovered, but they have also been completed! They are the companion pieces to the other sections that were showcased here and are once again from 'Warlord Games'. Perhaps unsurprisingly, given that they hailed from the shortcut emporium that is 'Warlord Games' they were not the best of casts, but any air bubbles were easily filled and of course they are a perfect match for the other sections; this been the case it was a simple task to replicate the paint scene and foliage used. Regardless of what I might think about their production standards, 'Warlord Games' do produce some lovely toys and these are no exception. As with the previous sections they come with identical corner sections, which allow me some flexibility when setting up on the table*, although as I write this I have just realised that there is no gate section! *fat chance of that happening any time soon! Nice stuff! Too bad that Warlord production quality is sometimes subpar compared to their sculpting quality. Same with the Perry Bros... Still far from the worst stuff I've seen. I had forgotten that I moan about the Perry moulding as well, good point. They do come up rather nicely, so ultimately happy to do a little bit of filling. Nice to see you got these sections ship shape. Thank you Robert, I've just spied some more that I like. Thank you and yes that would be the ticket. You could be in the west of Ireland. They have no gates. When it comes to moving livestock, they kick over a section of wall, let the cows through, and then rebuild it. No mortar in the joints. Fascinating and thank you for the subsequent picture, I must try and edit the post over the weekend. Thank you Mark, the base is a worry, but I'm hopeful that I've disguised enough of it so that it blends in nicely with the board. Lovely work as ever Michael. They will make a difference to your table, one day . . .
That's some sturdy cover. Great job dude! Thank you Bob, pretty pleased with how they turned out in the end. Looking good. You could always knock together a quick gate to go between two corner pieces. Sounds like a plan Brian, thank you. They certainly clean up well - in the end! Yes, very nice, with just a right amount of autumn leaves sprinkled delicately upon the ground. Thank you Jay, everyone painstakingly placed by hand. Nice terrain pieces here, Michael. very good job, now you'll have to scratchbuild a gate! I'll have to have a go at that, thank you Luca. These could have multiple uses. 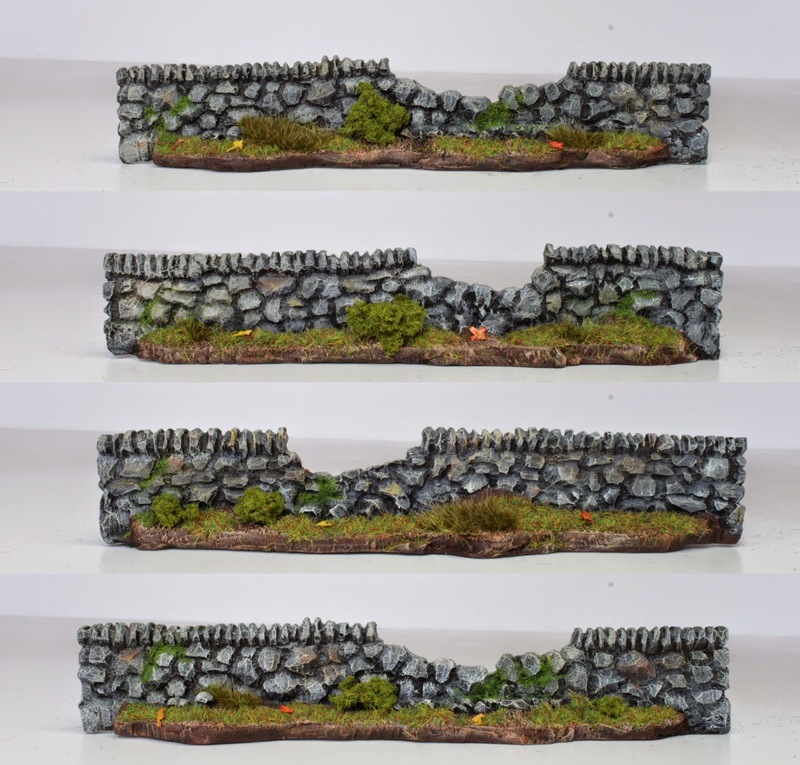 From wargaming to scenery for photographing your mini's. They look good to me Michael! Thank you Anne, they will certainly feature as a backdrop in the near future, Im sure. Good work Michael, always a pleasure to see good terrain. Thank you Scott, coming from a man whose terrain is nothing short of magical, brings a smile to my face. Well done, nice and useful! Thank you Phil, hopefully should prove useful before too long. Great work on the stone walls Michael! Great looking additions to any collection my good man!